Have at the one of the girls with the longest hair in the world: it’s 5 Feet 2 Inches long and she’s only 5ft 3in tall. She is 12 years old and she has never once in her life cut her hair. But living with hair as long ans hers is no walk in the park. Natasha Moraes de Andrade lives in a poor city in Brazil, and her family gets by on just one salary, but despite that, their annual shampoo bill is £400. Wanna know what else you have to do to get hair like hers? Natasha has never set foot in a hair salon and still she has full, thick and long hair, but as always, when we have something, we want things at the extreme opposite. Well so does this 12 year-old girl, who grew tired of having to care for her extremely long hair and she plans to sell it. So If you were wondering how you can have hair like hers, you might just be able to get this wonderful Rapunzel-like hair. How much do you need? Ohh… about £3,500. Why so expensive? Well, being the teenager with the world’s longest hair is very exhausting, she has to spend an hour daily to brush it, she can’t do any sports, and she can’t even turn on the ventilators in her house due to the fact that her hair might get caught in it… just imagine the typical Brazilian heat with no ventilation. We hope she finds her happiness, be it with long hair, short hair or how ever she wants it to be. Now let’s have a look at some women with even longer hair! Xie Qiuping is a Chinese woman who holds the record for the longest hair in the world. 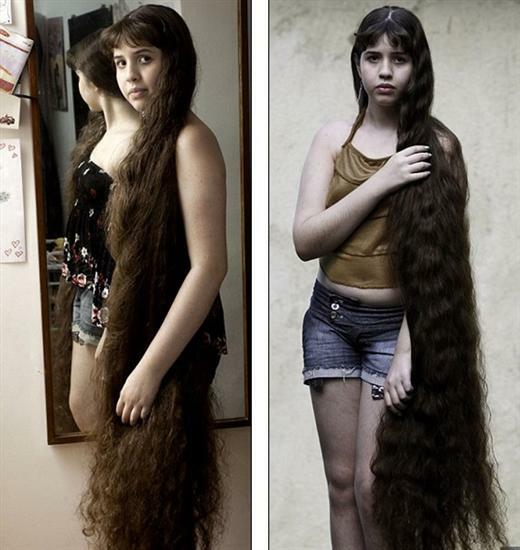 She hasn’t cut her hair since 1973, when she was 13 years-old and since 2004 she holds the record for the longest hair in the world. 2. 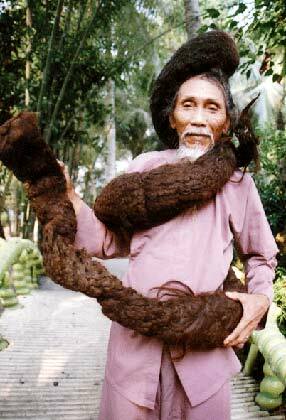 Man with longest hair in the world: Tran Van Hay 6.3 m (20 ft 7 in). Tran Van Hay died in 2010 at the age of 79, and when he died, he hadn’t cut his hair in more than 40 years. He stopped cutting it when he and his wife had their first baby in order to prevent illnesses (old myth) and he just started getting used to it so he decided never to cut it again. a lifetime later he was the amazing man with hair which was longer than 6 meters. How about the official world record keeper for the longest female hair? People like this should be IMMEDIATELY euthanized. ALL deformed babies such as Siamese twins, Shemales, etc. should be destroyed at birth. It is RIDICULOUS to allow them to live in suffering. The same is true for ALL those suffering from MASSIVE obesity. NOBODY should be allowed to have more than two children. ALL criminals should be IMMEDIATELY euthanized. To do otherwise is TOTALLY IMMORAL.